365 Best Paleo Diet Recipes In One Book! Includes 365 Paleo recipes for each day of the year. It is time to build the perfect Paleo diet plan and start seeing results. Want a healthier diet? Don't want to gorge on junk food and processed sugars? Well, this is the perfect Paleo cookbook for you. Maria Moore has crafted a power-packed solution for all of your Paleo needs and wants. Whether you are on the 30 day Paleo diet or looking for simple Paleo slow cooker recipes, this is the all-in-one solution for your requirements. Diets can be nerve-wracking without a plan, but this read provides everything you need to know before starting. Paleo diet for beginners can be challenging, but it does not have to be. This Paleo cookbook is a one-stop solution to ensure healthy eating is straightforward for you and the family. All of your nutritional needs will be met in this read and you will adore the recipes being created. Stop restricting yourself with the foods being consumed. The Paleo diet is a powerful option that provides quality now and in the future. Getting on that Paleo diet meal plan is not going to be as difficult as one may assume. Go through these recipes and notice how simple it can be. Teaser Of What's Inside: • Lobster Salad • Cauliflower Popcorn • Taco Bites • Turkish Lamb & Eggplant Kebabs • Grilled Pork Lettuce Wraps • Salmon Wasabi Burgers • Bell peppers stuffed with Steak and Pastrami • Pulled Beef Shepherd’s Pie • Beef and Broccoli Stir Fry This an all-encompassing read for those who wish to consider this lifestyle change. Once you understand the Paleo secret, you will never look back. Join Maria Moore on this journey and start eating right! 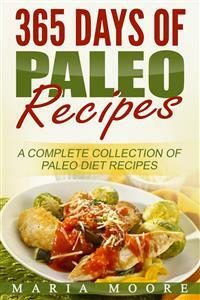 Buy today and enjoy over 365 Paleo recipes! First edition. December 25, 2016. Copyright © 2016 Maria Moore. Have you ever seen old cave paintings? Have you ever seen any fat or obese human depicted in those? No, right? It is a fact; our ancestors were a lot leaner and healthier than what we are today. There was no obesity and they suffered from a lot less diseases than we suffer from today! The basic premise of the Paleo diet is that our forefathers were healthier then because they consumed the foods that our digestive system is built to digest easily. With the shift from food gatherers / hunters to settled farmers, our food underwent a massive composite change, but our digestive system remained the same. So, while following the Paleo diet, you are encouraged to consume the foods that were easily available to our Paleolithic ancestors, such as fruits, nuts, meats and vegetables, and avoid the foods that weren’t available to them – namely grains, legumes, dairy products and all processed foods! Sound difficult? Well, it is easier than it sounds and once you get a hang of the basic dos and don’ts, you will be on your way to a healthier lifestyle in no time at all! & To help you get a head start on your new diet, I have provided you with 365 recipes in this book that cover various meals and courses – such as smoothie recipes, breakfast recipes, bread recipes, salad recipes, beverage recipes, etc. All the recipes in this book are quick and easy to prepare and can be made using easily available ingredients! I would like to take this opportunity to thank you for purchasing this book and I hope you enjoy reading it! Add egg, salt, mustard and lemon juice to the blender and blend until smooth. With the blender running, slowly pour the olive oil. Blend until the consistency you desire is achieved. Store in an airtight container in the refrigerator until use. Whisk together all the ingredients. Store in an airtight container in the refrigerator until use. Add all the ingredients to a blender and blend until smooth. Add a little water if you want thinner sauce. Transfer into a saucepan and bring to a boil over medium heat. Pour into a jar and refrigerate until use. Roast the eggplant either in an oven at 400 degree F or grill it. Place the roasted eggplant in a bowl of cold water it for a while. Remove the skin and discard it. Place the eggplant along with rest of ingredients except parsley in a blender and blend until smooth. Transfer into a bowl and refrigerate until use. Before serving drizzle some more olive oil on top. Sprinkle parsley and serve. Cook bacon in a skillet until brown over medium heat. Add onion and garlic and sauté for a couple of minutes. Add artichoke hearts and spinach and sauté for 2-3 minutes. Remove from heat and cool. Add coconut milk and whisk well. Place a saucepan over medium heat. Add all the ingredients to the saucepan. Stir and let it simmer until the strawberries are cooked. Remove from heat and let it cool completely. Pour into a jar and refrigerate until use. Add stock, oil and tapioca flour to a bowl and whisk well. Transfer to a heavy bottomed saucepan and heat stirring constantly and bring to a boil. Remove from heat. Add rest of the ingredients. Whisk well. Place the pan back on low heat. Stir constantly for about 2 minutes and remove from heat. Cool and transfer in an airtight container. Refrigerate until use. Add all the ingredients except herbs to a blender and blend until smooth. Transfer into a bowl. Add herbs, stir and chill until use. Add rest of the ingredients and stir. When done, mash and serve. Place a large skillet over medium high heat with oil. Add sausages and red pepper flakes and cook until brown breaking it simultaneously. Transfer into the slow cooker. Add rest of the ingredients except mozzarella and stir. Cover and cook on Low for 4 hours. Add mozzarella, stir and serve. Add oil, onions, butter and a pinch of salt to the slow cooker. Mix well, cover and cook on High for 8 hours or until the onions are caramelized. Strain the liquid and add onions to a bowl. Add rest of the ingredients, mix well and serve. Place a large skillet over medium high heat with bacon fat. Add onions and garlic and sauté until onions are translucent. Add meat and cook until brown. Drain off the excess fat in any. Transfer into the crockpot. Add rest of the ingredients, cover and cook on Low for 6-8 hours. Place turkey cubes in a slow cooker. Mix rest of the ingredients together in a bowl. Pour over the turkey. Cover and set the cooker on Low for 6-8 hours. Note: Add more water or milk you are using to dilute the smoothie if you desire a smoothie of thinner consistency. Pour in glasses and serve with crushed ice. Pour into glasses and serve with ice. Add all the ingredients to a blender and blend until smooth. Pour into glasses and serve with crushed ice. Pour into glasses. Sprinkle some cayenne pepper. Garnish with strawberries and lime slices. Serve. Pour into glasses and serve with crushed ice. Pour into glasses, and serve with crushed ice. Pour into glasses, garnish with a little ground cinnamon and serve. Add mango, water, and milk to the blender and blend until smooth. If it is too thick add more water or milk. If it is too watery, then add more mangos. Divide and pour into 4 glasses. Clean the blender and add strawberries. Blend until smooth. Add more milk or water if necessary. Add ice, banana, and sweetener and blend until smooth. Pour over the mango layer in the glasses. Clean the blender again and add spinach, ice and a little milk and blend until smooth. Pour over the strawberry layer. Add all the ingredients to the blender and blend until smooth. .